On October 6, 2018 the Midwest Renewable Energy Association (MREA) will host a free statewide Solar Tour as part of the 23rd Annual National Solar Tour. This year’s National Solar Tour is the first to host solar open houses in every state. Thousands of solar-powered homes, schools and businesses throughout Wisconsin and across North America will open their doors to the public in celebration of the 23rd Annual National Solar Tour. MREA is proud to highlight the work of Wisconsin’s growing clean energy workforce and progress towards wide-spread solar adoption in Wisconsin communities. Research shows that solar is contagious, and that households, businesses, and farms are more likely to install solar if others in their neighborhood have already done so. On Saturday, October 6, 2018 a variety of solar-powered homes and businesses across Wisconsin will be on display, with free tours from 10a.m. – 4p.m. The Solar Tour affords participants the direct perspectives of homeowners, businesses, and installers about the costs, processes, and benefits of going solar in Wisconsin, highlighting the many ways Wisconsinites are reducing their monthly energy bills, cutting harmful carbon emissions, and improving their property values. Additionally, The Wisconsin Solar Tour features sites that have recently gone solar through MREA’s Solar Group Buy Programs. “Since 1990 MREA’s mission has been to promote renewable energy, energy efficiency, and sustainable living through education and demonstration. By hosting the Wisconsin Solar Tour, we hope to encourage neighborhood conversations about going solar, and the growing need and benefits of building solar-powered communities,” said MREA Communications Coordinator, Kaitlyn Kohl. 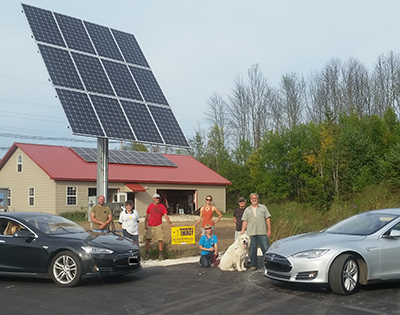 In 2017, the Wisconsin Solar Tour contributed 45 sites and over 250 participants to the National Solar Tour. In recent years, the National Solar Tour attracted more than 150,000 people in 49 U.S. states and Puerto Rico. This is the first year all 50 states are participating in the Tour. The National Solar Tour gives insight on the progress and benefits of solar adoption throughout the United States. For example, a recent report showed carbon emissions in California were reduced to levels last seen in the 90’s. The decrease was attributed to an increase in wind and solar energy in the electric power sector, displacing the use of fossil fuels. Not only are we seeing environmental benefits from solar, but economic benefits too. Wisconsin is currently home to 75,044 clean energy workers – 62,299 in energy efficiency and 5,660 in renewables like solar and wind. Clean energy is creating hundreds of thousands of jobs; MREA hopes the Wisconsin Solar Tour will highlight industry professionals’ work, and show residents that renew-able is do-able in Wisconsin. The Wisconsin Solar Tour (Oct. 6) is free and open to the public. Register your site, view more information and current site locations at www.midwestrenew.org/solartour/ or call us at 715-592-6595. New sites are being added daily. Fill out the Solar Tour Host form. If you have any questions please contact us at 715-592-6595.